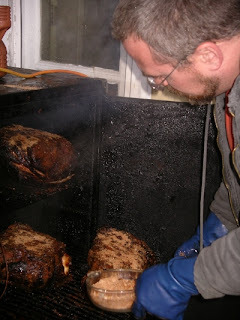 The pork shoulders went into the pit on Sunday, rubbed with spicy goodness. They stayed on all day while we worked on the rest of our Christmas projects. Here's the lone action shot I remembered to get. I've been working on ribs so much as of late that I had forgotten some of the steps to cooking shoulders. It was good to do a refresher. I'm going to have to cook some more in the next few weeks.